Georgios Dimitriadis thought he had botched the data. It was late on a Friday night and the University of California, Santa Cruz, astronomer was the last one in the office. He had been waiting anxiously for NASA’s planet-hunting Kepler space telescope to stream a batch of data toward Earth—not because he wanted to scour the observations for signs of exoplanets but because he was looking for a supernova. See, Kepler was designed to do one thing remarkably well: Monitor stars so closely that it could catch tiny flickers in brightness. That made it ideal for finding exoplanets (that obscure their host stars’ light)—as well as making an array of other observations such as recording the rise and fall of light emitted during a star’s death throes. So when Kepler’s mission was extended, astronomers decided the telescope should scour more than 20,000 galaxies in order to catch as many supernovae as possible. And when one erupted in a spiral galaxy only 170 million light-years away last January, Dimitriadis knew it would be the best look yet at the first moments behind the cosmic detonation. But the data provided a better record than he had even hoped for. “I thought I had done something wrong—not because there is noise, but because it was so good,” Dimitriadis says, explaining astronomers typically miss the first few days or even weeks after a supernova explodes and then monitor it once every night. That gives them relatively few data points. But here astronomers had images before the explosion and every 30 minutes thereafter. “I had never seen something like this before,” he says. What is more: The supernova’s brightness rose sharply during those early moments, creating an unexpected “bump” in the graph of its changing light over time, called a light curve. Dimitriadis circled that bump in red and drew an arrow toward it with three question marks before sending the light curve off to his collaborators. They have since analyzed that bump—in an attempt to determine the eruption’s hidden trigger—in a new paper accepted for publication in The Astrophysical Journal Letters and available online. The object, designated SN 2018oh, belongs to a class called “type Ia” supernovae. These eruptions each detonate at roughly the same luminosity and can therefore be used as cosmic beacons to measure the vastness of the cosmos. (Because astronomers know how bright these objects are in reality and how bright they appear on Earth, they can calculate the distance to the far-off explosion). For this reason they are commonly referred to as standard candles. And because they are so standard, astronomers have long assumed they are like fireworks built in a cosmic assembly line—each one constructed the same way as the next. But there is one major hiccup: Although each is set off by the death of a white dwarf—a burnt-out, roughly Earth-size remnant of a sunlike star—these objects are too stable to explode on their own. Instead, there must be a hidden assassin. And astronomers have long-argued over whether that assassin is a second white dwarf or a giant star. If it is a white dwarf, then the two stars will spiral toward each other and collide in a violent explosion. 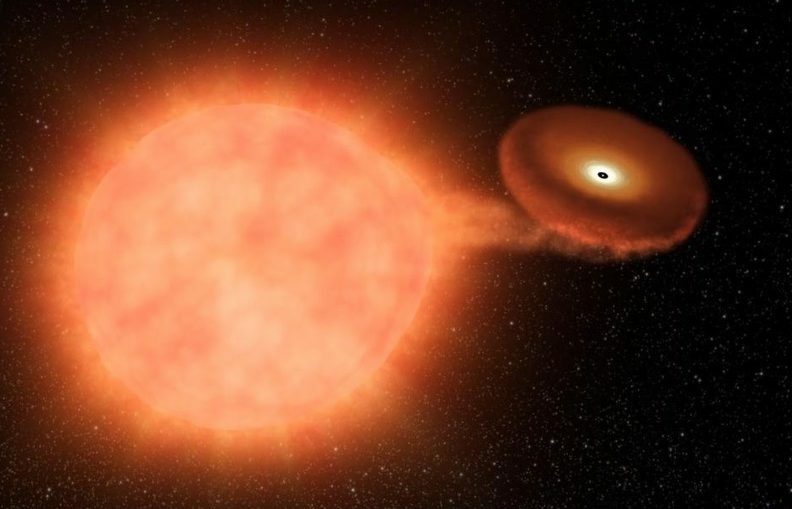 If it is a larger star, then the white dwarf will steal material from this companion until it can no longer support its extra weight, and ultimately blows itself to smithereens. Which assassin is the true culprit? That has been a mystery for 50 years, but SN 2018oh just might reveal an important clue from the cosmic crime scene. In the second scenario the companion star does not spiral inward, but rather survives—leaving a trail of evidence behind. In 2010 Daniel Kasen, an astronomer at the University of California, Berkeley, and a co-author on the paper, predicted that in this scenario the ballooning cloud of debris from the supernova will run into the surviving companion star—a process that heats the wreckage and causes the debris to brighten—thus creating a bump in the early light curve. And just like the hottest part of a flame is blue, that bump should similarly be blue. Astronomers have long searched for this signature and have even spotted a handful of supernovae where abnormal data points could point toward this elusive blue bump—but none were as obvious as this. Dimitriadis and his colleagues argue this is the best evidence yet for a massive companion star. But others, like Benjamin Shappee, an astronomer at the University of Hawaii at Mnoa, disagree. In a second paper also submitted to ApJ Letters and available online Shappee and his colleagues argue for the first scenario instead—the one where two white dwarfs spiral in toward each other to set the supernova in motion. Here, there is no surviving companion star. So how does Shappee explain the early bump? His team argues it is caused by a blob of radioactive material at the surface of one of the white dwarfs that glows prior to the supernova’s peak brightness—thus explaining the early light bump. And it is not such a wild idea: Although there are many different models that describe the dangerous tango between white dwarfs, one popular model predicts such a dollop of radioactive stuff on the star’s crust. Regardless of which scenario wins, it looks like these objects can form via two different stellar assembly lines, argues Ryan Foley, an astronomer at U.C. Santa Cruz and a co-author on Dimitriadis’ study. “Even if you don’t want to say that this is a collision with a companion star, it’s still a problem because we know that not all type Ia supernovae have this sort of bump,” he says. “So, at the very least, there’s something going on with the explosion that creates this diversity in the first few days after an explosion.” How do these supernovae maintain such “standard candle” luminosities when they actually follow different paths? In fact, their brightness can vary a bit, but in a very predictable way that astronomers can correct for because the brightest supernovae fade more slowly than their dimmer kin do. Luckily, the explosions’ role as cosmic milestones is on solid ground, but a better understanding of their diverse causes will only improve the precision of the measurements based on them. Or, as Foley says, “the broad strokes won’t change, but it can matter in the details.” And those details are crucial if astronomers want to unravel the great cosmic mysteries of our time, like dark energy—the poorly understood phenomenon that propels the expansion of the universe—for example. Only a precise measurement of the expansion rate throughout cosmic history (garnered by distances measured with the help of type Ia supernovae) will allow astronomers to discover whether dark energy has changed over time and therefore pin down what it actually is. But it all depends on that deadly tango and whether these stars dance with a variety of companions—from the massive stars that lend them more gas than they can handle to their twins that may crash into them.